“MY TASK has ended…I am functus officio.” With these words, former Chancellor Victor Emanuel Crane, concluded his assignment as Chairman of the Awards Assess­ment Committee during the pre­sentation ceremony of the Presi­dent’s Awards to Private Sector Industry last Saturday night. 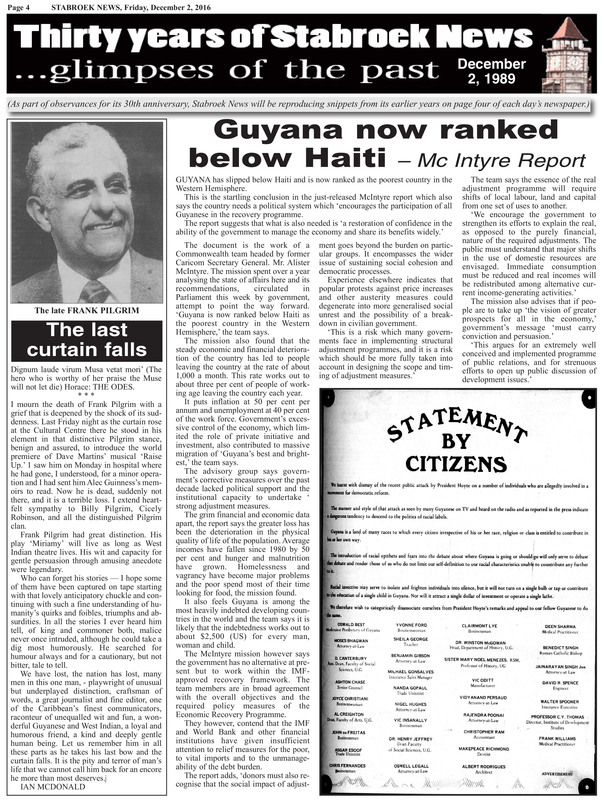 By SHARIEF KHAN CHAIRMAN of the dissident Federation of Independent Trade Unions of Guyana (F1TUG) and President of the Guyana Public Ser­vice Union (GPSU), Mr. The American firm, Atlantic Tele-Network company, (ATN), is buying 80 per cent of the holdings of Guyana Telecommunication Corporation with the state retaining 20 per cent, government announced yesterday. 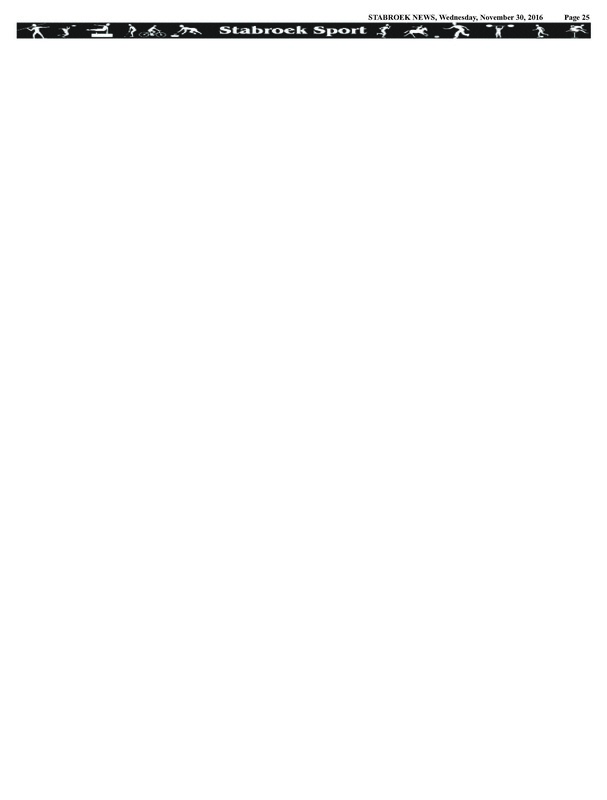 An open letter Mr. Adam Harris, Editor-in-Chief, Daily Chronicle. 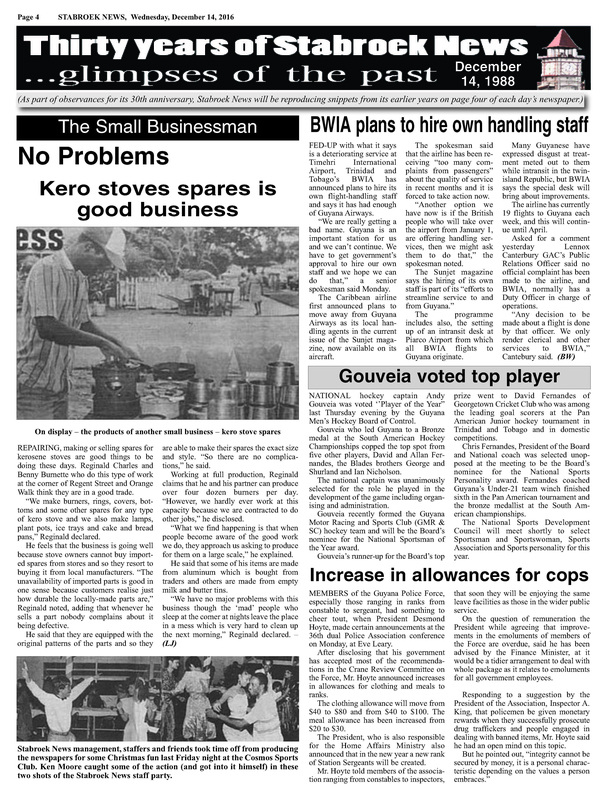 Dear Adam, I note that you have reacted strongly to our attack on your report of the suicide of Mr.
No Problems :Kero stoves spares is good business REPAIRING, mak­ing or selling spares for kerosene stoves are good things to be doing these days. By Eion Jardine THE sports world was a sadder place when he died. SCRIPTURAL read­ings, the singing of hymns and an anthem as well as a sermon by a Methodist priest will form part of the, programme for the re­committal of the re­mains of the late Pre­sident Forbes Burnham on Sunday in the Bo­tanic Gardens. Eight of those seeking a better life By Cuthbert Monchoir FOURTEEN Guyanese footballers have failed to return from the United States of America where they had gone to play Mexico in an Olympic round-robin play-off in Los Angeles. Reflections on the Miss World contest – Mandy Jardim BEAUTY QUEENS have, in the past, been mistaken for pretty, smiling simpletons. Means test for pensioners should be $750 – Mrs Jagan tells Parliament PPP Member of Parliament Janet Jagan on Wednesday accused the government of giving a “death penalty” to old age pensioners. 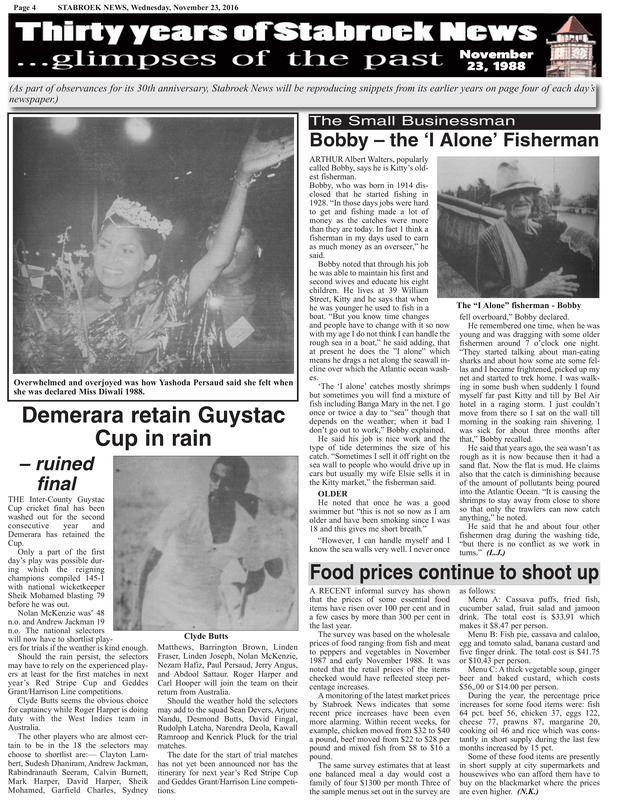 (First Published: December 8, 1991) President of the Berbice Chamber of Commerce and Development Association, Ramdehol Bhookmohan, says the country’s economy is in its worst state ever, inspite of the much publicised ERP programme. One free exercise book per term A SENIOR official at Guyana Printers says the lack of paper due to a shortage of foreign exchange has tem­porarily put a halt to production of ex­ercise books. DELAYS in the issuing of passports by the Passport Office are coining under in­creasing criticism from members of the public. 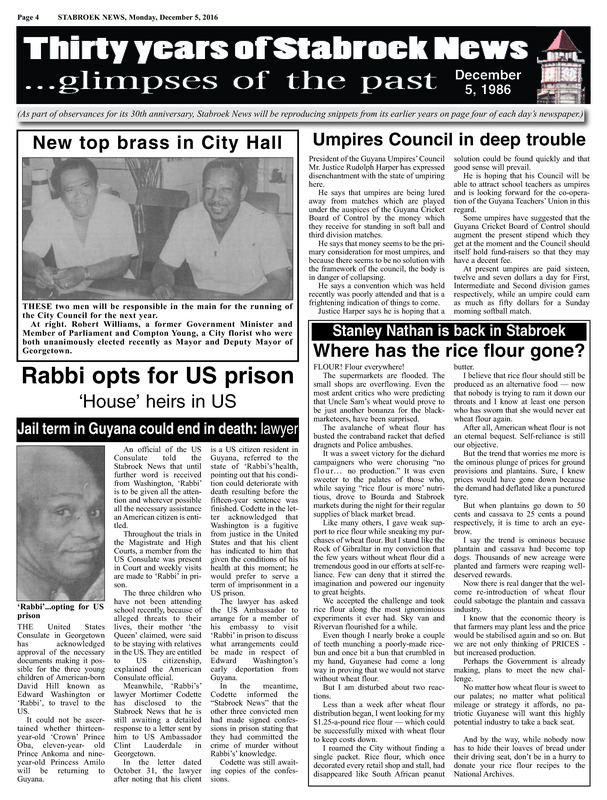 President of the Guyana Umpires’ Council Mr. Justice Rudolph Harper has expressed disenchant­ment with the state of umpiring here. First Published: December 4, 1987. 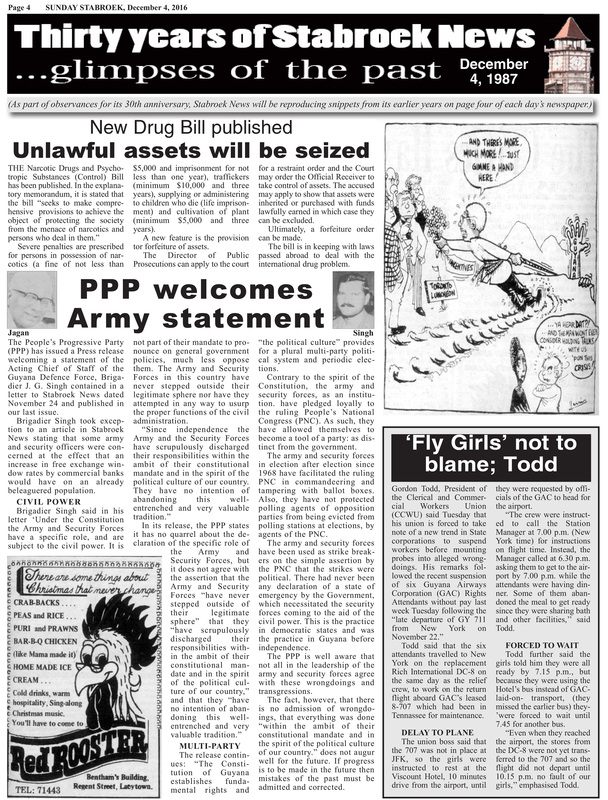 THE Narcotic Drugs and Psycho­tropic Substances (Control) Bill has been published. 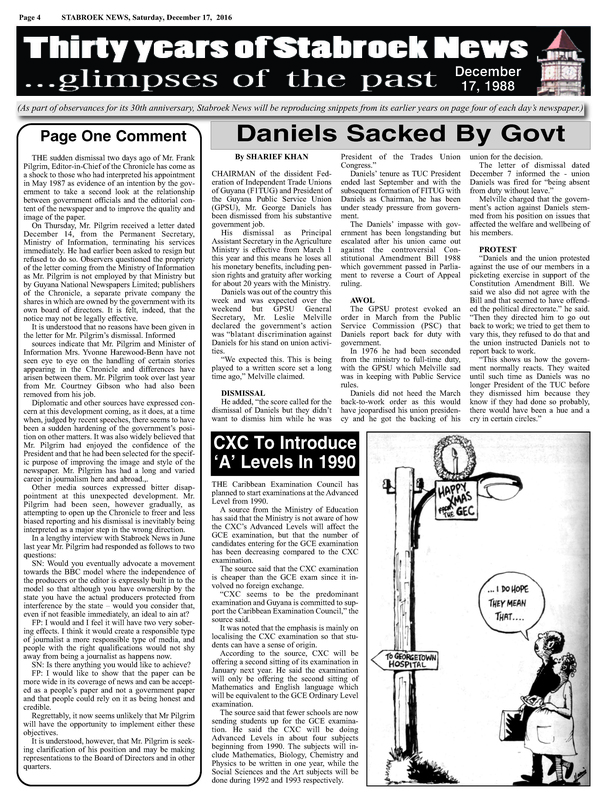 First Published: December 3, 1988. A friend remembered ROSEMARY KEMPADOO, friend, sister, co-mother, comrade to many died in England on Tuesday November 15. 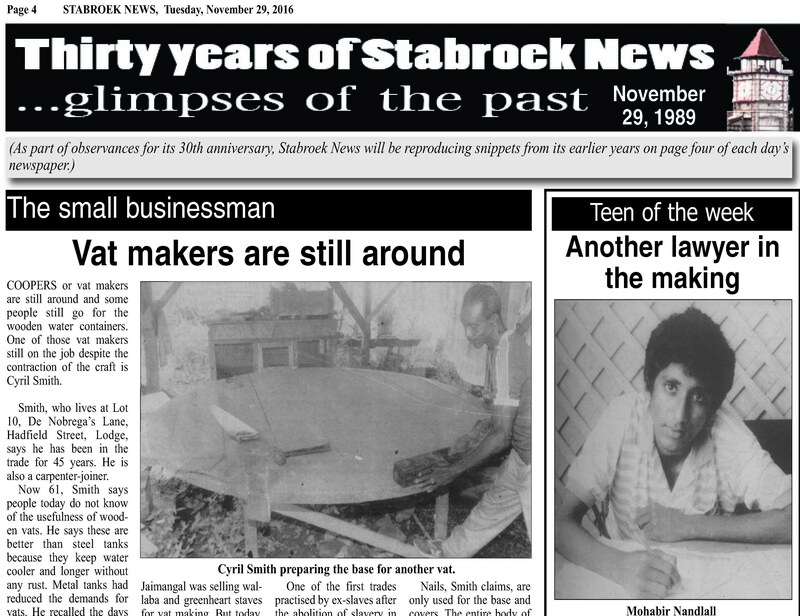 Editor’s Note: The following articles, from December 2, 1989, are being reprinted as part of Stabroek News’ ongoing observances to mark its 30th anniversary. THE state information agency GPCA yester­day reported the lightn­ing electricity strike had shut down the Kingston power plant and output had dropped from about 27 to around 12 megawatts. BOAT builders are a dying breed in Guyana, but Peter Mendonca, the Bissoon brothers, Sona, Mohan and Narine and their Father Chaitram say that they intend to make the trade their career. COOPERS or vat makers are still around and some people still go for the wooden water con­tainers. 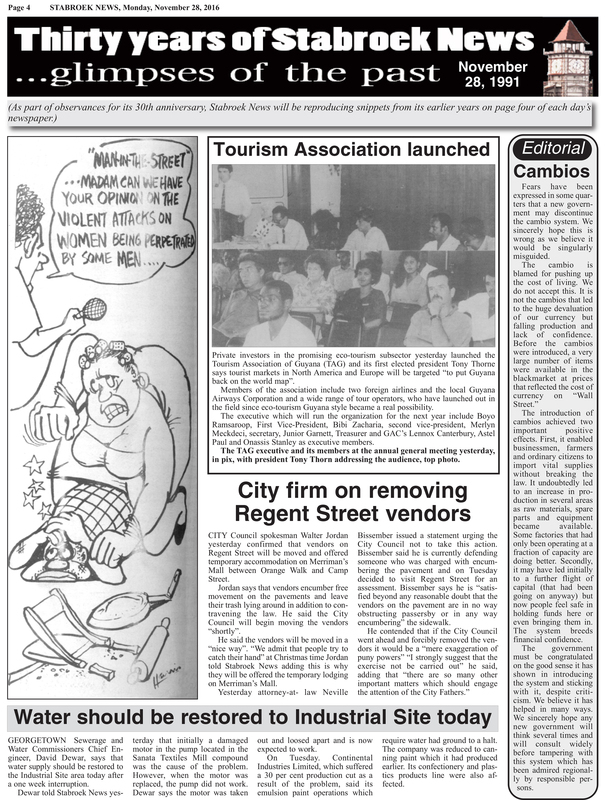 Private investors in the promising eco-tourism subsector yesterday launched the Tourism Association of Guyana (TAG) and its first elected president Tony Thorne says tourist markets in North America and Europe will be targeted “to put Guyana back on the world map”. ON the east side of Main Street, sandwiched between State House and what was once the Cambridge Hotel, stands one of Georgetown’s most handsome buildings. 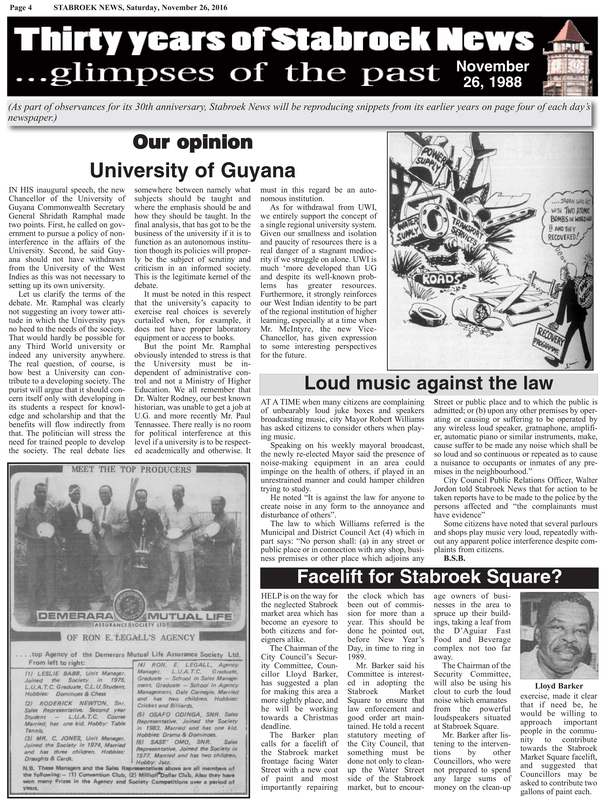 IN HIS inaugural speech, the new Chancellor of the Univer­sity of Guyana Commonwealth Secretary General Shridath Ramphal made two points. 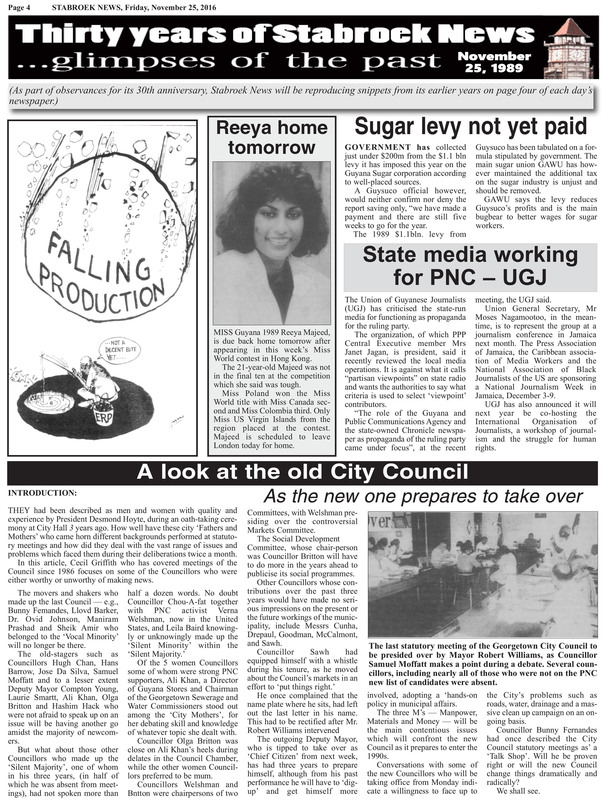 MISS Guyana 1989 Reeya Majeed, is due back home tomorrow after appearing in this week’s Miss World contest in Hong Kong. 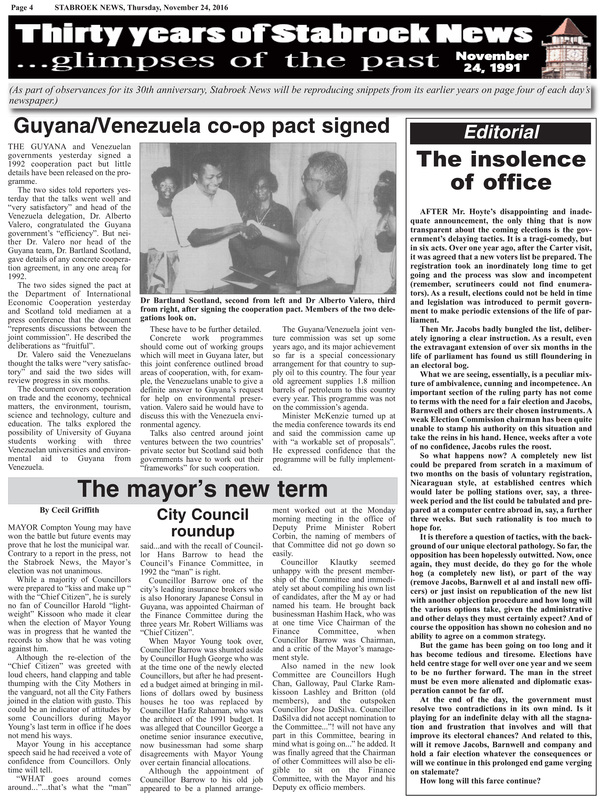 THE GUYANA and Venezuelan govern­ments yesterday signed a 1992 cooperation pact but little details have been released on the programme. THE Inter-County Guystac Cup cricket final has been wash­ed out for the sec­ond consecutive year and Demerara has retained the Cup. 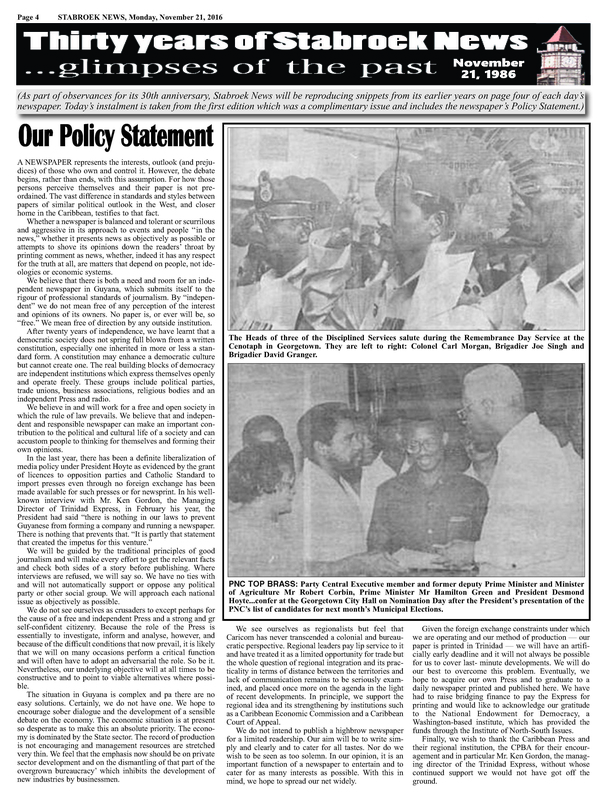 ONE of the implications of the budget was that with the influx of funds from the Support Group and other institutions the foreign cur­rency situation would improve considerably and the Bank of Guyana would be better able to deal with the legitimate requests of business­men for raw materials, spare parts and other items. 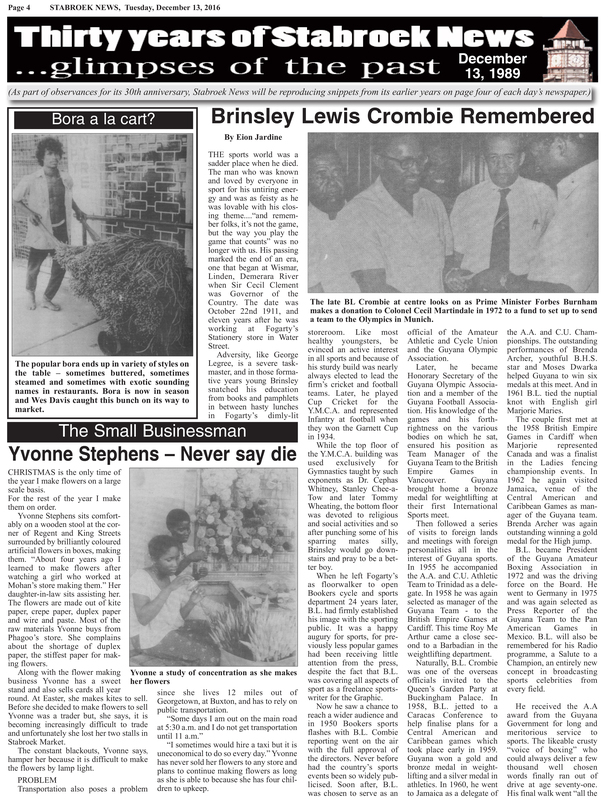 A NEWSPAPER represents the interests, outlook (and prejudices) of those who own and control it.